A plan was needed for a two car garage that would look nice, be easy to build, and include a one bedroom apartment upstairs. The roofline swoops down over the exterior stairway to help keep it dry. The roof also covers the upper deck providing a protected porch with a view. This also provides weather protection outside the garage doors below. This cabin is practical enough to build as a temporary residence while building a house. 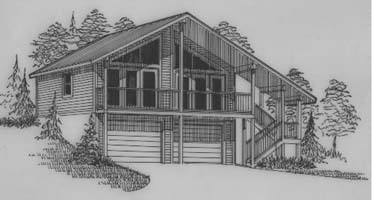 It is attractive enough to serve as a guest cabin when the house is done. It would also make a nice apartment for taking care of a relative. This is the only pre-designed plan I offer for sale. I can also offer revisions for a reasonable fee.